When Constance Markievicz stood for election as MP for Dublin St Patrick’s in 1918, few people believed she could win the seat – yet she did. A breakthrough in the bitter struggle for female enfranchisement had come earlier that year, followed by a second landmark piece of legislation allowing women to be elected to Parliament – and Markievicz duly became the first female MP. A member of Sinn Féin, she refused to take her seat. She did, however, pave the way for future generations, and only eleven months later, Nancy Astor entered the Commons. A century on from that historic event, 491 women have now passed through the hallowed doors of Parliament. Each one of these pioneers has fought tenaciously to introduce enduring reform, and in doing so has helped revolutionise Britain’s political landscape, ensuring that women’s contributions are not consigned to the history books. 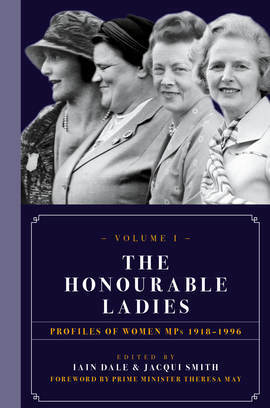 Containing profiles of every woman MP from 1918 to 1996, and with female contributors from Mary Beard to Caroline Lucas, Ruth Davidson to Yvette Cooper and Margaret Beckett to Ann Widdecombe, The Honourable Ladies is an indispensable and illuminating testament to the stories and achievements of these remarkable women. This book is a fascinating insight into the lives and achievements of the women who served as Members of Parliament between 1918 and 1996. Their stories deserve to be told and having them together in one place will be a great resource and a worthy recognition of their contribution to our political life and to the House of Commons. A very good read. Essential reading for anyone interested in politics and equality […] It’s a delight to thumb through and randomly pick someone to read about. A tribute to these women of politics and progress. A well-written anthology and essential read, written by the pioneers of today, about the pioneers of yesterday, as a message to the next generation.